I grew up an arcade junkie. If I had money in my pocket, I couldn’t wait to get to the nearest video game or pinball machine. I remember when the best video games were in arcades, not something you connected to your television at home. Which leads me to write about using 3D Printing technology to repair a bit of nostalgia. My good friend Stuart, an Associate Professor of Communications at the University of Louisville, approached me with a problem during a round of golf. 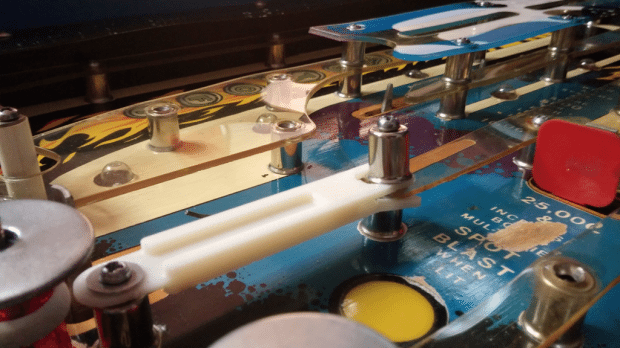 One of his vintage pinball machines, a wondrous solid-state link to my youth, had broken. Not the entire machine, just a piece of plastic that separates two possible paths for the pinball to travel. As you can imagine, replacement parts for old pinball machines are not something you pick up at a local store. So last fall on the 19th hole – that means drinking a beer to you non-golfers – Stuart handed me the broken piece and later sent me a picture of where it went in his pinball machine. I began by scanning the broken off plastic next to a ruler. Using SolidWorks, I inserted the scanned image into a sketch of a new part. I then resized the sketch picture to use as reference. With the broken part, the scanned image, and the picture, I had everything I needed to create the replacement piece. Other than having to make a few guesses about the metal standoffs for a secure fit, the solid model was fairly simple to generate. The key aspects of the design are the slot cutout on one end for adjustment and the split U-shape for wrapping around the standoff posts and capturing the end of the still attached plastic. With my design completed, I used a Mojo Desktop 3D Printer to build a prototype. I built up the sides a bit to help withstand the impact of the pinball into the part. As a self professed Pinball Wizard, I didn’t want to chance the part breaking shortly after installation. That would be like three fast drains after you start your game. Other than time, like golf season when I started and Christmas season when I saw Stuart again, it was time to try out the repair kit! One evening on the way home from work, I stopped by to visit Stuart and help him with the 3D Printed repair part install. The installation process took about twenty minutes. 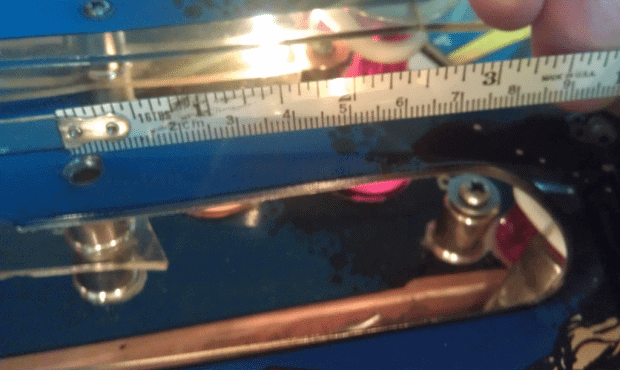 As you can see, I missed a little bit on the diameter of the metal standoffs, causing one side of the part to flare out into the path of the pinball. While this was easily fixed with an exacto knife, I did revisit the design and build a second prototype. The second prototype was installed on a Sunday during the NFL Divisional round of playoffs. I recall it well as I scored one of the highest games that a guest has played on that machine! 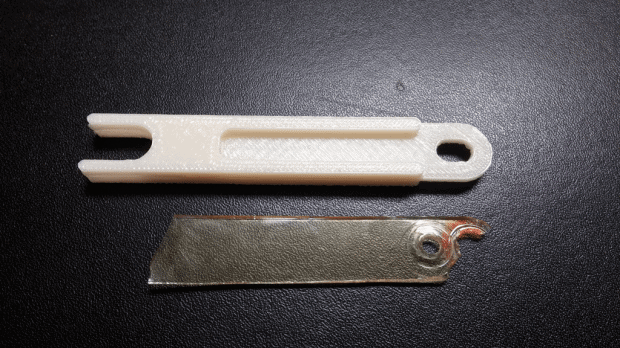 I did learn and confirm a few things while creating this 3D printed repair part. First, pinball games are still great fun! Second, a picture and a broken part are enough to repair a pinball machine. (At least this one.) Third, I have found a new business opportunity for a budding entrepreneur! In closing, while my normal tagline is ‘go make your products better with SOLIDWORKS Simulation’, this time I’ll go with ‘now go make your product on a 3D Printer’! As the recipient of this fix, let me attest to the fact that this works like a charm. My first intersection with 3D printing and wow this is very cool! While Bill may have exaggerated a bit about his pinball expertise 🙂 ….. that was some darn fine MacGyvering. Way to think outside the box Bill! Thanks.